Cooler Master has reached 20 years of providing high quality chassis and cooling solutions this 2012. 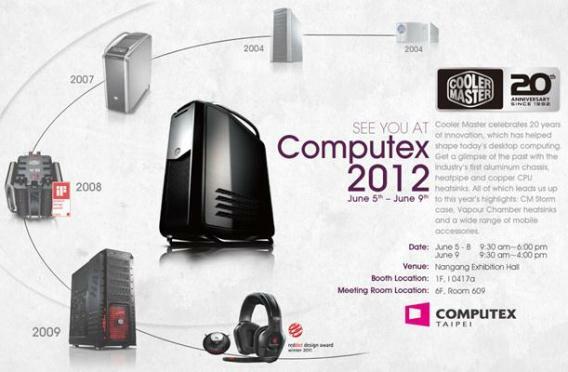 In line with this, Cooler Master will be at Computex 2012 this coming June 5 to 9, 2012, and will be showcasing products in Nangang Exhibition Hall, 1st floor. Cooler Master will be displaying its latest creations as well as some past products. Most probably, the Cooler Master Cosmos II which was released this year, will also be showcased in the said event. Below are some of the products that will be showcased at the Computex 2012 according to Cooler Master’s press released. CM Storm Scout II – An all-new update to the original award-winning CM Storm Scout, this case has a steel reinforced rubber carrying handle, support for up to a 240mm (2 x 120mm) liquid cooling radiator, and removable HDD cages for extra long graphics card support. Elite 120 – A mini-powerhouse, Elite 120 supports a standard-sized optical drive, power supply, and high-end graphics cards within its small enclosure. It includes an aluminum finish front panel, USB 3.0 port, and support for up to three hard drives. Silent Pro Platinum – 80 Plus Platinum certified power supplies with up to 25% in energy savings over other power supplies. It operates on a single powerful +12V rail and includes dedicated 7V fan ports. TPC 812 – The world’s first tower CPU cooler to incorporate Vertical Vapor Chamber Technology. It features two exceptionally efficient Vertical Vapor Chambers that can dissipate up to 130W each. Eisberg liquid cooling – Prefilled closed loop liquid cooling setups with either a single 120mm fan radiator or dual 120mm fan radiator. It features only the highest quality German designs and manufacturing. CM Storm Sonuz – It is built to impress the most discerning set of ears with its high quality 53mm drivers and the microphone arm can be connected on either side. CM Storm Recon – Ambidextrous gaming mouse that features a multi-color mouse wheel for profile selection and the powerful Avago 3090 optical sensor that can deliver 800 to 4000 DPI. DPI, Liftoff Distance, and USB Polling adjustments can be made on-the-fly. Mobile Accessories – Greater focus on Mobile solutions with four finely crafted aluminum stands, Arc, JAS PRO, L-stand, and Clutch. It includes the E Stand I100 and Ultra Slice Cooling Pad slim notebook coolers for Ultrabook cooling. Cooler Master CM Storm Scout 2 Advance Unleashed!